Atypical mycobacterial disease is due to colonization by large numbers of organisms or impairment of immune system. They are found in soil, water, plants, and animal excreta. , Mostly saprophytic, they have low pathogenicity, with no evidence of direct person-to-person transmission. Runyon's scheme is a useful classification. Organisms are divided into four groups based on their rate of growth and pigment production: photochromogens (I), scotochromogens (II), nonphotochromogens (III), and rapid-growing species (IV). The organisms causing otomastoiditis are in group III and IV, Mycobacterium avium Intracellulare (MAI), Mycobacterium fortuitum, and Mycobacterium Chelonae). M. fortuitum was included in group IV because of its rapidly growing nonpigmented colonies. It was first identified in 1938 by Cruz from a post-injection abscess and is currently believed to be the major pathogen in group IV. It can involve the eye, lungs, skin, and subcutaneous tissues. There are reports of it causing osteomyelitis, endocarditis, cauda equina abscess, urogenital, and gastrointestinal (GI) infections. We report an interesting case of aural involvement by this organism and compare it with the previously reported cases (totally five in number) in the literature. A 33-year-old female patient presented with complaints of right ear discharge since 1 month, decreased hearing, and tinnitus. Otoscopic examination revealed mucoid discharge and moderate size perforation in the right ear and healed perforation in left ear. Audiometry revealed bilateral moderate conductive hearing loss. Diagnosis of chronic suppurative otitis media tubotympanic type, active stage was made. She was prescribed amoxicillin and antibiotic ear drops. One month later, the patient came back with history of severe pain and swelling behind the right ear since 1 week, but no discharge from the ear. Inspection and palpation of the right post-aural area revealed a 2 × 2 cm sized fluctuant tender swelling. The skin over the swelling was normal. 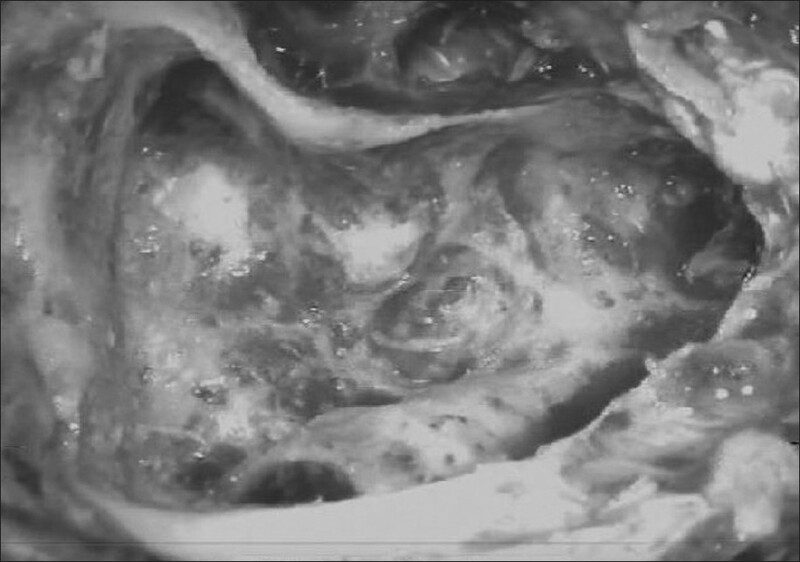 Microscopy showed a dry, moderate sized perforation in right ear. Audiogram revealed 53 db hearing loss. X-ray mastoid (Schuller's view) revealed haziness in the mastoid cortex [Figure 1]. Diagnosis of right side post-auricular sub-periosteal abscess was made and the patient was taken up for mastoid exploration. The abscess led into the bony defect in the mastoid, filled with thick mucopurulent discharge. There was lot of granulation tissue and unhealthy looking mucosa in the mastoid cortex [Figure 2] which was sent for histopathologic examination. The discharge was sent for acid-fast bacilli (AFB) staining and culture. Post-op period was uneventful and post-auricular scar healed well without gaping. 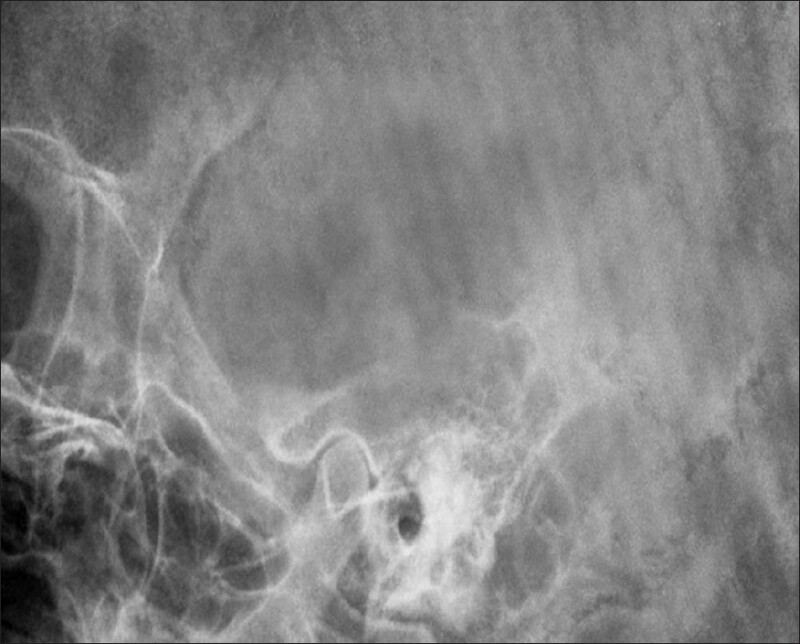 Figure 1: X-ray right Mastoid Schuller's view showing haziness of mastoid cortex. Figure 2: Intraoperative picture showing granulation tissue in the mastoid cortex. The histopathologic examination revealed granulomatous mastoiditis (granulation tissue with foci of neutrophilic microabscess, scant casseous necrosis surrounded by palisading epithelioid cells, focal epithelioid granulomas with Langhans giant cells, and neutrophils) [Figure 3] and [Figure 4]. It was AFB and periodic acid-Schiff (PAS) negative. She was investigated for any pulmonary focus of tuberculosis by means of chest X-ray, and sputum examination by AFB staining and culture, but everything came negative. Diagnosis of primary tubercular mastoiditis was made and she was discharged on antitubercular treatment which the patient completed at her place of residence. Initially she was put on four drugs (isoniazid, rifampicin, pyrazinamide, and ethambutol for 2 months, and then rifampicin and isoniazid for 4 months). In the next follow-up, the patient was asymptomatic, the tympanic membrane had completely healed, but to our surprise, the culture of the pus from mastoid cortex grew M. fortuitum. As she was doing fine on conventional antitubercular treatment, we did not alter it. The patient is asymptomatic for more than 1½ years now. Since the introduction of chemotherapeutic agents, tuberculous involvement of the middle ear and mastoid has become rare. Involvement of the ear by atypical mycobacteria is not easily diagnosed because of low index of suspicion as it is very rare and also due to difficulty in diagnosis. M. fortuitum grows more slowly than the bacteria more commonly incriminated in wound infections and is easily overlooked if routine cultures are discarded after only 48 h of growth. Also, because of the close similarity in their colony characteristics, an erroneous diagnosis of Mycobacterium tuberculosis may be made if the rapidity of growth on culture media is not carefully noted. The tubercle bacillus can reach the ears by one of the three possible routes: the blood stream, Eustachian tube More Details, or external auditory canal. Retrograde infection through the external auditory canal is the most frequent route. Unclassified saprophytic acid-fast organisms have previously been observed in cerumen and in apparently normal ear canals. History of repeated aural instrumentation, patent ventilating tubes, and chronic administration of steroid ear drops predispose for the entry of the organism into the middle ear. Although reports of otic infections due to atypical mycobacteria are becoming more common, cases of such infection due to M. fortuitum remain quite rare; to our knowledge, only five cases have been documented in the medical literature till now. ,,, Two more related cases were found, one with M. fortuitum and M. chelonei complex  and the other where it could not be made out whether the organism was M. fortuitum or Mycobacterium peregrinum. Out of these seven cases, five had a history of use of ventilation tubes (a proposed risk factor for otic infection due to mycobacteria). The earliest reported case occurred in a 63-year-old man with mastoiditis complicated by a sub-periosteal abscess at the mastoidectomy site. Cultures of abscess drainage yielded M. fortuitum that was resistant to all drugs tested. The patient was treated with a combination of isoniazid, rifampicin, ethambutol, and etionamide; no duration of therapy or outcome was reported. The second case was a 10-year-old male child with chronic mastoiditis complicated by subdural empyema and meningitis. Abscess drainage and ventriculoperitoneal (VP) shunt was done. Pus and cerebrospinal fluid (CSF) culture was done, which revealed the organism and its sensitivity to amikacin. Amikacin was given intravenously, intrathecally, and intraventricularly for 4 months. The fifth case, a 14-year-old girl with persistent otitis media, underwent mastoidectomy and was initially put on intravenous amikacin and clarithromycin. But culture was found to be amikacin resistant. Later, she was put on oral trimethoprin-sulfamethoxazole for 12 months and hyperbaric oxygen therapy (HBO). This case report emphasized the use of HBO which promotes fibroblast deposition of collagen, facilitating healing. It also enhances the leukocyte phagocytic killing of Gram-positive organisms and the aminoglycoside killing of Gram-negative organisms. HBO has been reported to be successful against mycobacteria, in particular, Mycobacterium leprae. The other two related cases were: the first one was due to M. fortuitum and M. chelonei complex in a 3-year-old boy treated with ciprofloxacin and erythromycin for 12 months  and the second one was due to M. peregrinum. This case was a 9-year-old female, who underwent mastoid exploration two times and she also developed meningitis and subdural empyema. She was treated with rifampicin and clindamycin initially, then with doxycyclin and meropenem along with hyperbaric oxygen. Because the Centers for Disease Control and Prevention (CDC) did not classify to the species level, the authors were not certain that this case was not caused by M. peregrinum, which phylogenetically is very closely related to M fortuitum. It is a member of the M. fortuitum group and was considered a biovariant of M. fortuitum until 1992. To summarize, the common symptoms are odorless and colorless or brown discharge, aural fullness, otalgia, unsteadiness, and diminished hearing. Physical examination in patients with atypical mycobacterial ear infections has not revealed the multiple perforations classically described with tuberculous otitis media. Abundant granulation tissue in the middle ear and mastoid is a common finding. Definitive diagnosis is made by tissue biopsy and mycobacterial tissue culture, which must be incubated for at least for 4 weeks. Surgical debridement has been effective in all of the cases. Most of the case reports advocate the use of newer antibiotics (e.g. imipenem, clarithromycin, and the fluoroquinolones). Some cases have used the conventional antitubercular drugs (e.g. isoniazid and rifampicin). ,,, Our case was similar to these cases as it was managed by antitubercular drugs with satisfactory results. M. tuberculosis is notoriously difficult to culture from infected ears due to rapid overgrowth by other bacteria. 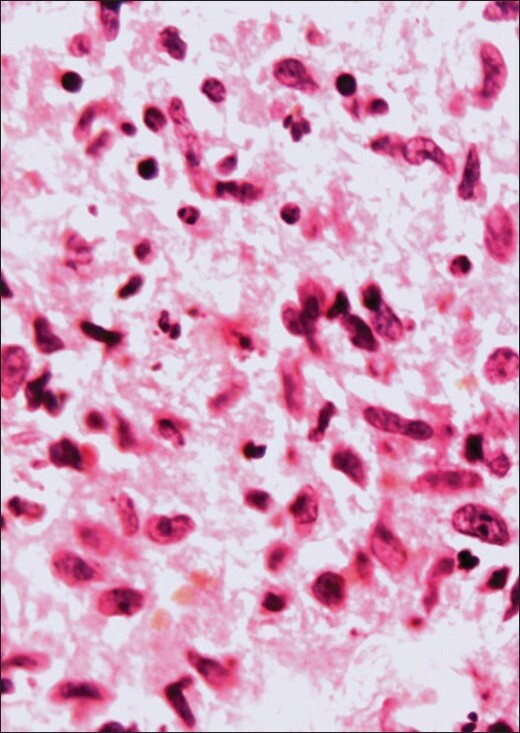 Generally, treatment is based on the finding of AFB on smear, particularly if the histopathologic study was suggestive of tuberculosis. In the light of present knowledge, careful consideration of that policy is necessary, and the importance of confirmation of the diagnosis by culture techniques is emphasized. Important conclusions from the review are that atypical mycobacteria are an unusual cause of otomastoiditis; therefore, a high index of suspicion is required for accurate diagnosis. The history is nonspecific, but exposure to contaminated water may be the source of infection. Exuberant granulation tissue in the external auditory canal, middle ear cleft, or mastoid air cell system is uniformly present. Chest radiographs are normal, and the Purified Protein Derivative (PPD) test can be nonreactive. These infections occur in immunologically normal individuals, especially children. Mycobacterial tissue cultures must be incubated for at least 4 weeks, and definitive antibiotic therapy is based on sensitivities. Pathologic examination reveals caseating granulomas, often with negative AFB stains. 1. Cotran RS, Kumar V, Robbins SL. Robbins pathologic basis of disease. Philadelphia: W.B. Saunders Co.; 1989. p. 373-82. 2. Brown-Elliott BA, Wallace RJ Jr. Clinical and taxonomic status of pathogenic non pigmented or late-pigmenting rapidly growing mycobacteria. Clin Microbiol Rev 2002;15:716-46. 3. Runyon EH. 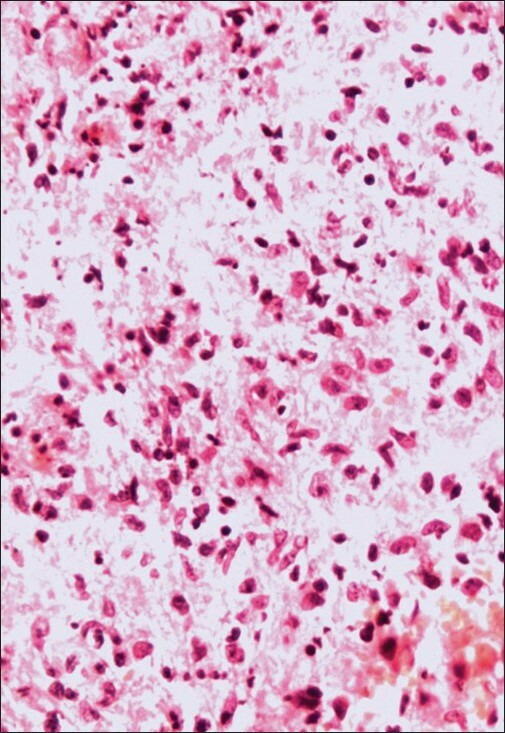 Anonymous mycobacteria in pulmonary disease. Med Clin North Am 1959;43:273-90. 4. Austin WK, Lockey MW. Mycobacterium fortuitum mastoiditis. Arch Otolaryngol 1976;102:558-60. 5. Dolovasio JR, Pankey GA, Wallace RJ, Jones DB. Clinical usefulness of amikacin and doxycycline in the treatment of infection due to Mycobacterium fortuitum and Mycobacterium chelonei. Rev Infect Dis 1981;3:1068-74. 6. Neitch SM, Sydnor JB, Schleupner CJ. Mycobacterium fortuitum as a cause of mastoiditis and wound infection. Arch Otolaryngol 1982;108:558-60. 7. Moerman J, Dierick J, Mestdagh J, Boedts D, van Cauwenberge P. Mastoiditis caused by atypical mycobacteria. Int J Pediatr Otorhinolaryngol 1993;28:69-76. 8. Liening DA, Plemmons RE, Fair KP, Butler WP, McAllister CK, Davis MG Jr. Mycobacterium fortuitum otitis media. Otolaryngol Head Neck Surg 1997;117:S131-3. 9. Ter Konda RP, Levine SC, Duvall AJ III, Giebink GS. Atypical mycobacterial otomastoiditis. Laryngoscope 1995;105:1275-8. 10. McAvoy MJ, Carron MA, Poulik J, Attinok D, Belenky W. Sequelae of rapid growing mycobacteria otomastoiditis in a child. Arch Otolaryngol Head Neck Surg 2009;135:602-4. 11. Franklin DJ, Starke JR, Nrady MT, Brown BA Wallace RJ Jr. Chronic otitis media after tympanostomy tube placement caused by Mycobacterium abscessus: a new clinical entity? Am J Otol 1994;15:313-20.